Attached is a scan of an unusual undated photo 4.40 x 6.40 inches of the towboat MAMIE S. BARRETT after she was retired and serving as a restaurant/showboat with her own name on the portside bow and the name PIASA on the pilot house, which according to Keith Norrington the boat was called while she was in the boat harbor at West Alton, Missouri (across the river from Alton, Illinois). Keith also informed ME me that "the upper works of the BARRETT burned in 2017 at Deer Park, Louisiana. It was reported that this occurred during high water when she floated into some power lines, starting a blaze. Only the main deck now remains." 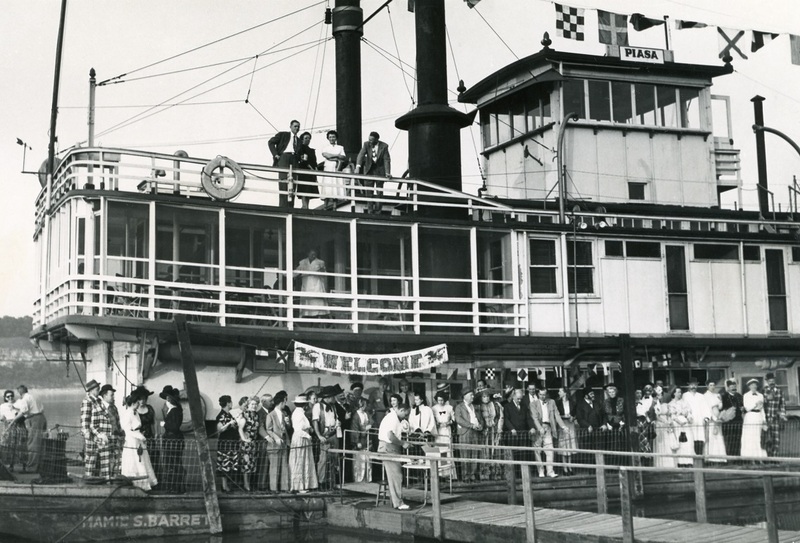 In this photograph about 25 of the folks on the main deck are dressed in Gay 90's costumes which suggests that they were either performers in a showboat melodrama, costumed guests at a party or as Keith conjectured possibly during the filming of a motion picture. A gent on the wooden dock appears to be taking tickets next to the mini-gangplank where the boat was boarded. Photos taken of the BARRETT by Keith Norrington and others while she was abandoned out of the water at Rosedale in Iberville Parish, Louisiana and before she was reduced to her main deck in the 2017 fire can be viewed by entering the boat's name in a GOOGLE search. 1921 at Jeffersonville, Indiana by Howard Ship Yard. Home port or owner's residence circa 1921, Louisville, Kentucky. The BARRETT was sold to U.S. Engineering Department and her certificate surrendered on October 22, 1923. The BARRETT appears in the Rock Island District inventory in 1926. Renamed PENNIMAN in 1935. In the early 1980s, her original name MAMIE S. BARRETT was restored and she became a restaurant on Kentucky Lake. In 1987 she was sold and moved to Vicksburg where she operated as a restaurant/Showboat through 1991. From TWILIGHT's 2018 calendar printed sharp and clear with true color on heavy glossy stock. First rate! 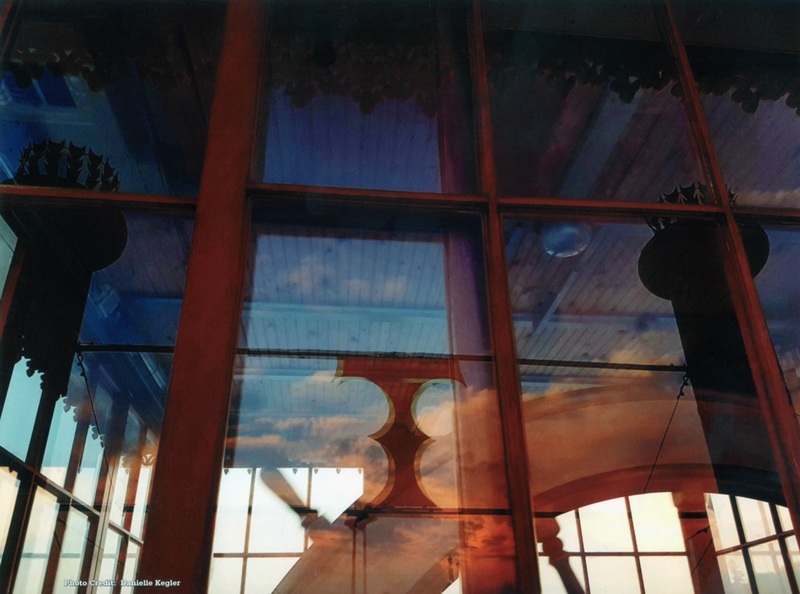 My favorite is the photo from September with Danielle Kegler's reflections of the stacks in the pilot house windows with the pilot wheel visible on the inside. Captain Lew Clark rebuilt the Twilight from the old TRAVELER. He painted her cherry red and did job towing with her. Belonged to several owners, referred to as the "cat with nine lives" because of all the mishaps she endured over the years. 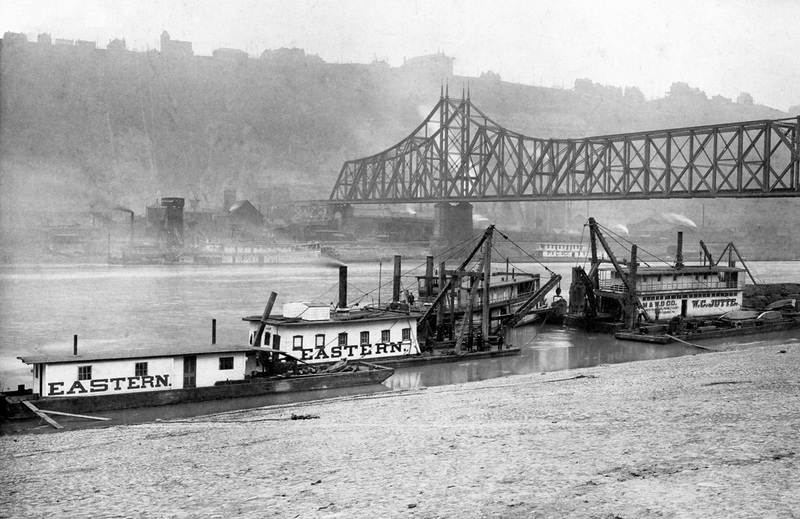 May 13, 1891 she burned at the foot of Ferry Street, Pittsburgh along with two other boats; she was rebuilt. In April, 1898 she hit her hog-chain braces on the 43rd Street bridge, punched them down through the hull and sank. December 3, 1905 she sank clear to the roof in a flood at Lock 2, Monongahela River, after going over the dam. In February, 1909 James A. Hornbake, engineer, was drowned off her at Duquesne, Pennsylvania. On October 7, 1917 she was going along full head near Braddock, Pennsylvania and took a nose dive and sank. In 1918 she was going under the 16th Street bridge on the Allegheny, an old wooden structure, during high water and the sparks from her stacks set the bridge on fire and burned it to a complete loss. On November 15, 1920 she caught fire and was nearly destroyed at Pittsburgh. On January 17, 1921 she sank near 31st Street on the Allegheny River at Pittsburgh. However, she was renamed J.H. McCRADY in May 1927 and continued service at Middletown, Pennsylvania as the TRAVELER. 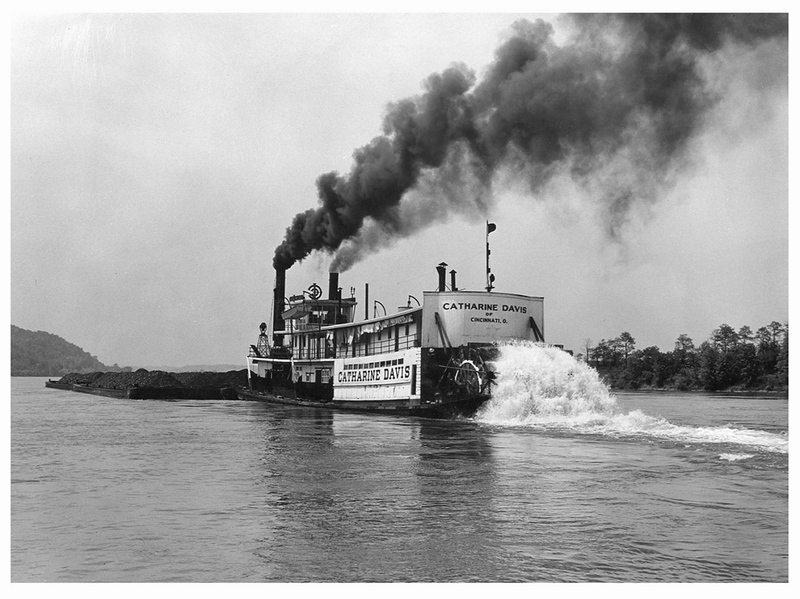 The towboat CHEROKEE worked for the Louisville district of the U.S. Engineers and is evidently pushing quarter boats to a sight along the Ohio River to house and feed crews working on an engineering related project. I like the windmill on the wharf boat in the left foreground. Perhaps the windmill provided power to pump water out of the river for a kitchen or rest rooms. 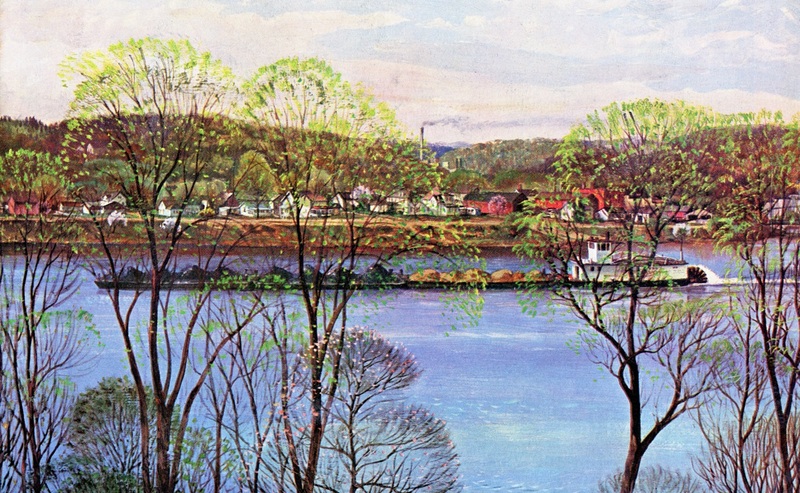 Artist John Clymer's painting of a sternwheel towboat on the Ohio River with the state of Ohio on the far shore as seen from the state of West Virginia. The LITTLE ANDY FULTON of Louisville, KY., at midstream near Mustapha Island in the Ohio River. Charming panoramic riverscape. Details on the towboat LI'L ANDY FULTON are interesting. The square structure aft of the texas with what looks like 2nd hand shutters for walls may have been where the cook kept live chickens fresh in case they were needed in the kitchen. In the 1880s, she was sold to the Duffies and became the first of their fleet. Used to tow coal, sand and gravel. 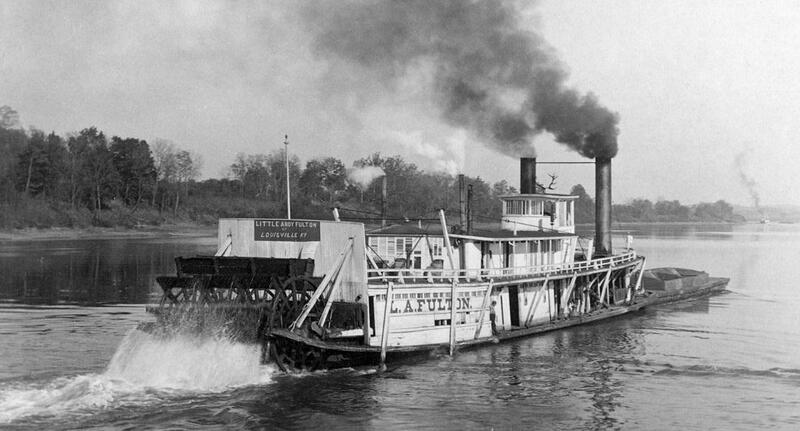 The name on the stern bulkhead was L.A. FULTON. After she was dismantled in 1891, her engines went to the FULTON. Detail from a real photo postcard of an unknown towboat pushing barges on the Upper Mississippi River taken from the bridge between Marquette, Iowa and Prairie du Chien, Wisconsin. The bridge that spans the river at this crossing presently opened in 1975 and since this image probably dates from the 1940s at the latest this photo must have taken from been an earlier span. NICE PHOTO TAKEN UNDER IDEAL LIGHTING CIRCUMSTANCES AND CLEAR VISIBILITY OF BOTH SIDES OF THE RIVER. BEAUTIFUL WATER AND NEAT CASCADE OF THE WHEEL AS WELL. TAKEN NEAR THE OHIO RIVERTOWN OF GALLIPOLIS (PRONOUNCED "GALLOP POLICE" BY THE RESIDENTS) ON THE OHIO RIVER. I SWEETENED THE CATHARINE DAVIS A BIT BY BRIGHTENING THE STERN ABOVE THE WHEEL AND THE BOILER DECK BELOW THE HANGING LAUNDRY PLUS THEN I USED A PROTOCOL TO REMOVE WHITE DUST FROM THE SMOKE. THE BULGED OUT CURVE AT THE STERN ABOVE THE WHEEL IS SOMETHING I DON'T RECALL SEEING IN PHOTOS OF ANY STEAMBOAT BEFORE, AN INTERESTING DETAIL WHICH MUST'VE MADE IT MORE DIFFICULT TO CONSTRUCT BUT IT'S NICE TO LOOK AT. ON TOP OF THE PILOT HOUSE OR BETWEEN THE STACK IS A CUT OUT "BULL'S EYE" WITH WHAT IS PROBABLY THE LETTERS "I" AND "C" FOR "ISLAND CREEK COAL COMPANY" WHICH OWNED TWO CONSECUTIVE BOATS NAMED CATHARINE DAVIS WHOSE DATES WERE 1896 - 1928 AND 1928 - 1949. THIS PHOTO LOOKS LIKE IT PROBABLY DATES FROM THE '40'S SO I'D GUESS THIS IS THE SECOND C.D. The towboat C.C. SLIDER (built in the style as the W.P. SNYDER JR.) from the March 2nd, 1929 edition of the Waterways Journal. Have upgraded the photo of the boat to a better quality copy of the same image from La Crosse. Text resized and reformatted and outlines enhanced. There is another ad on the same page regarding the Gardner Steering Gear that was installed on the C.C. SLIDER. 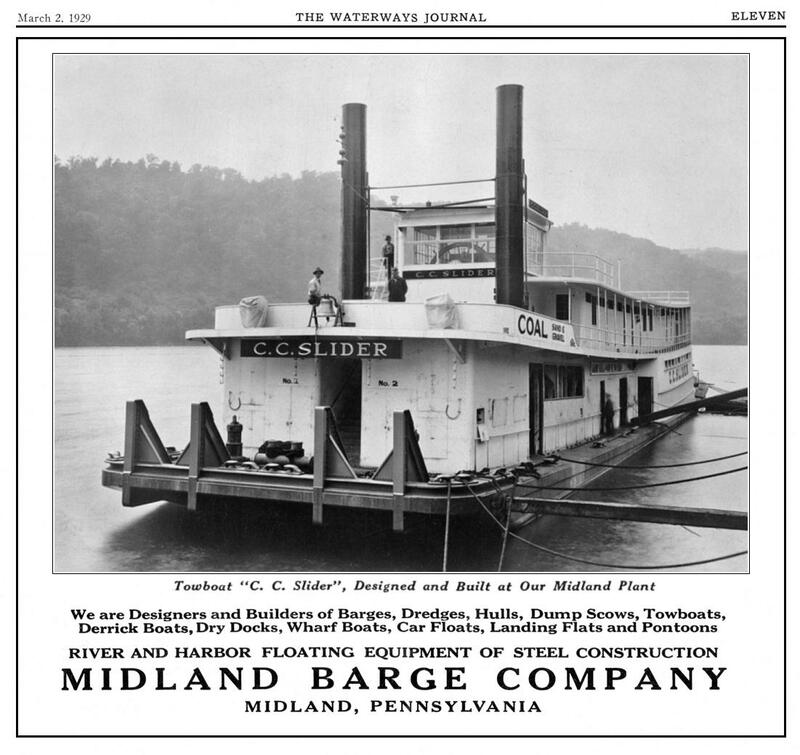 Eventually that ad will also be restored and enhanced to join this one on one of the towboat pages. Owned by E. T. Slider, Inc., Louisville, Kentucky; named for Chester C. Slider, son of E. T. Slider. 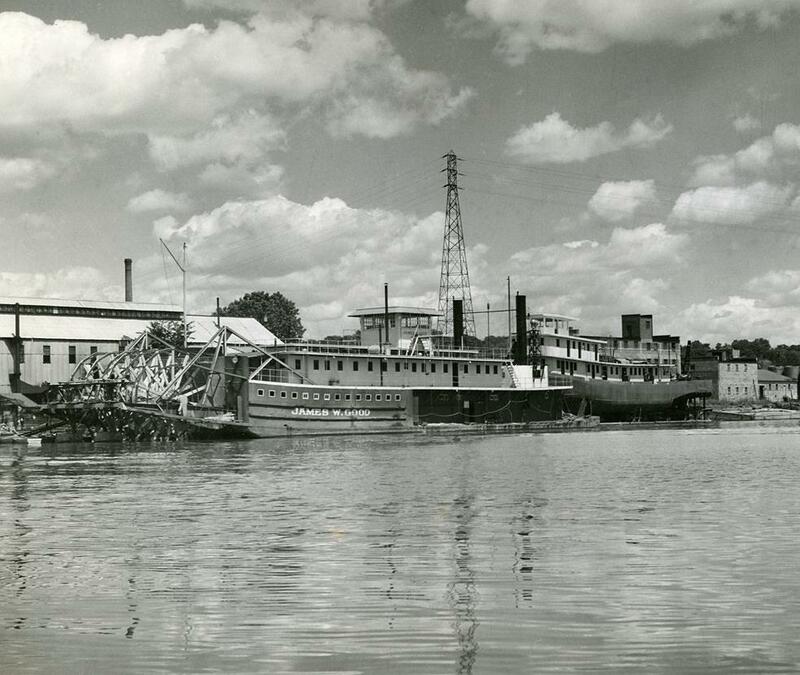 Although regularly employed in the Louisville area, this boat made frequent trips to Huntington for coal. Captain Ed Hauser of Jeffersonville was master for some time; he died December 1941. Captain Roy McBride was on her in 1938, 1939, maybe longer. H. M. Prather long was chief engineer. 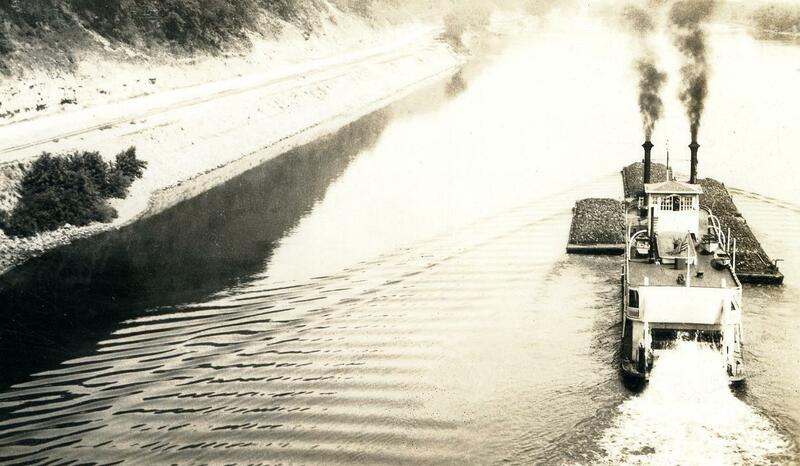 Boat was laid up for dismantling in 1952. This is a detail from an 8 1/2 x 13 1/4 inch photo, mounted on heavy board. On the back is written "Old Steubenville Bridge." 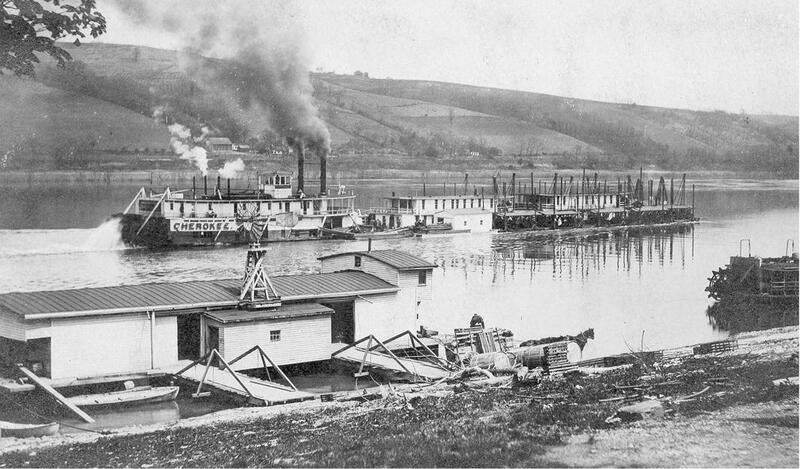 sternwheel towboat in the center cannot be identified and the boats all appear to be gathered on the shore to initiate a dredging operation. Statistical Area and is part of "Greater Pittsburgh" the 20th largest combined statistical area in the United States. Built in 1901 at Brownsville, PA in Axton yard, 121 x 24 x 4. Built for the Jutte interests and operated a long time by Peoples Coal Co., Pittsburgh. Capt. 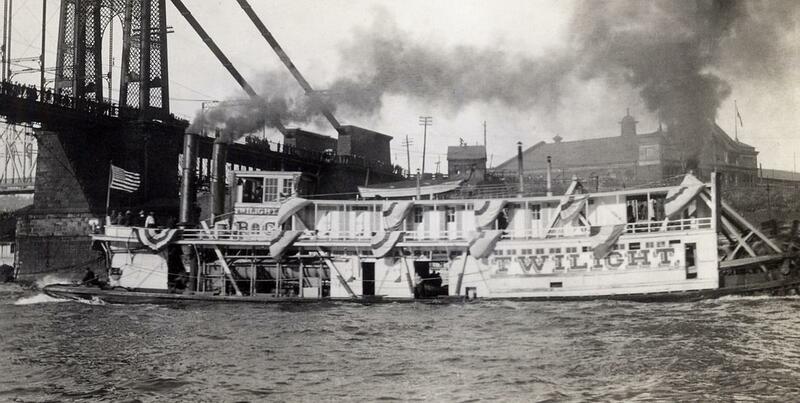 W. C. Jutte, for whom this boat was named, was general manager of Peoples Coal with offices in the Conestoga Building in Pittsburgh. Sand &Supply Co., Pittsburgh, bought her and later renamed her KEYSTONE. I plumbed and cropped the photo to square up the distant commercial buildings and boat's stacks and also separately plumbed up the text in the lower right so everything is leveled horizontally. 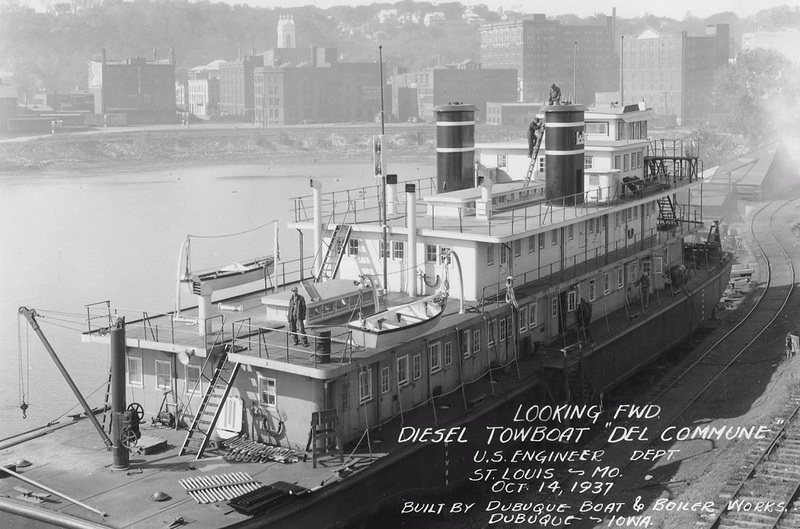 BEAUTIFUL CLOUDS, WATER AND BOATS IN A 1938 PHOTO OF THE TOWBOAT JAMES W. GOOD AT DUBUQUE, IOWA. This yard was started in 1852, as Rouse & Dean, a name that was later changed to Iowa Iron Works. Its assets were sold to John F. Killeen in 1904 and reconstructed as Dubuque Boat & Boiler Works. Initially it was located at Eagle Point, then, from 1882 on, in the Ice Harbor where the National Mississippi River Museum is now.